Let's look at the room I live in. That would be my sun room. This room was added on to our house after we turned what use to be a small drinking hole for cows into our pond. We could not look at the pond from the house. We had to go outside to look at it. So I was glad we added this room where we can enjoy it all year. I guess I should add that my husband and I did this whole room except for the framing. He did the wiring, connected the vents for heat and air, hung the windows and doors, put in the bead board, did all the trim and I helped lay the tile floor and I did all the painting and of course decorating. This is looking in from the breakfast room. I love my sun room. I truly love my Pottery Barn slipcovered sofa. This was a bit of a splurge, but so worth it. It is very comfortable to sit or lie down on. If it gets to looking dirty I can just take off the slipcovers and throw them in the washer and dryer. This is the room where I watch t.v. at night while Mr. Savvy watches the t.v. in the living room. We don't like the same shows so it is better to watch separately. He likes the SciFi channel and of course some car shows and I like sitcoms and reality shows. This is a shabby birdhouse I purchased at a little antique shop. I love this little green bird. This lovely little table was given to me by my sister. My mom gave her a coffee table she no longer wanted and my sister had always loved it and wanted it so she got Mom's and I got hers. It works perfectly in here. Love the shape of this table. Accessorized with a lamp from HomeGoods, stack of design books, a glass cloche, and a bunny looking on with his carrot. These two chairs use to grace my grandmother's living room, but were covered in a beautiful chintz. They were quite worn when I got them and I had them upholstered in this fabric many years ago. Now I would love to have white slipcovers made for them, but they work fine for now in my cottage style room. These chairs are very old and very well made. They are so heavy because they are made of solid wood construction. Chairs aren't made like that much anymore. Bamboo table bought really cheap at a home decor store. Accessorized with a reading lamp, apothecary jar from Southern Living at Home, design books, shabby bunny, topiary from HomeGoods, and a little Staffordshire dog. The louvered shutters were found at a local salvage yard and I painted and distressed them. Old sign bought at a local flea market. Lots of decorating magazines to look at. Shabby sign of cabins at Lake Rabun found at a flea market. Mr. Savvy's family is from Lake Rabun so I had to purchase this to hang in here. This is looking out at the pond. Paula Deen's brand new book just released yesterday. Thanks for letting me show you my favorite room. The room where I hang out and lie on the sofa, look at my magazines and books and look at the television. I am linking to Jenny Matlock's blog for Alphabet Thursday. I bet you can't guess what the letter is this week. O.k. I will tell you. It is the letter L. I know I know that was a hard one. Please be sure and click on the link and check out what the others are showing for the letter L.
I will also be linking to Show and Tell Friday over at My Romantic Home blog. Also joining the The DIY Showoff parade since we did most of this room ourselves. Oh, boy another party. I am linking to Whistle Stop Cooking Blog for Friday Favorites party. Thanks, Sandi for inviting me over! Thanks so much for stopping by. Love to hear from you! L O V E It!~ This has always been my favorite room in your home! The Lemonade clock is delicious! I think that would be my favorite room, too! I love the walls. And the all the decor goes so nicely together. Love those cloches! Oh Kim this is my favorite room too! I think I might pop over and hang out in there with you...is that OK? I love all of the color and your accessories! The plates on the wall, the pillows your beautiful side tables, lamps...I guess I love it all! I have been wanting to do a post of my favorite room...in my own house;)...and you have inspired me! I will be stalking the pics of this room...I hope you don't mind;)! I can see why this is your favorite room! Love the wall color and the different pillow colors on the sofa. The accessories are perfect and the clock is wonderful. I love this room Kim. I can see why it's your favorite. This room is so beautiful. As I have said before, we have very similar tastes. We will be adding a family room on the Cape house, as soon as the Inn sell, and it will look very similar to this. 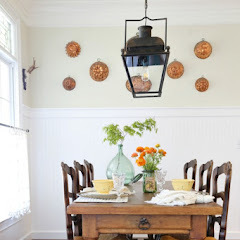 I love the wide beadboard walls and the color is great. Thanks for sharing! Oh, Kim, I can see why this is your favorite room! So bright and beautiful and the view outside. So nice! "What time should I be there for coffee tomorrow?" Oh my goodness! You have created a look that I want to change my bedroom into. Wanna come to my house! I will have to check out the Pottery Barn slipcovers for sure! But your taste is delicious. Thanks for the inspiration! Can I come hang out with you? We would get absolutely NOTHING done! No wonder you live in that room! Everything looks so nice together. I had to laugh...we watch TV in different rooms too. Kim, first let me tell you that I went straight to Amazon and ordered Paula's new book. I didn't know about it...can't wait for it to arrive! Your sunporch is just gorgeous. I always admire the green that is on the walls. All the little touches you have in there are perfect. Inquiring minds want to know, where did you find the bird lamp and the ruffled shades? I love them! It is a great room Kim. Bet you just love your time spent there. What a lovely post and a lovely room!!! Such great colors and accessories! I love the room. It looks so inviting. I had to LOL. You and your husband watch TV like we do. My husband and I are always watching different TV's too. This room is so welcoming. I would love to lounge on that couch and thumb through magazines or watch a little tv. What a fantastic space. I can see wht yor like your sunroom so much. I don't know if I would ever come out. I bet it's wonderful in the summer. I love your home and the sunroom is great. I would love to watch sitcoms in there with you and look out at the pond. I would have to be the one holding your little dog though! I just want to bring my glass of sweet tea with extra lemon and curl up on your couch and chat and read my magazines. I have this great cheesey corn dip that we could munch on and chat about all your beautiful pieces. I love how you know about each one of them, that is just like me! Also have you ever been to the Nashville Flea Market at the fairgrounds, great place! Beautiful room...beautifully decorated! I'd spend all my time in there too! Lovely room. Makes me want move in! What a wonderful room! It is so inviting! What a beautiful room ... it looks just right for lounging and reading and relaxing.... so pretty! I WANT that room!! It's soooo beautiful. Now I think I could really use a room just like that in my home. You did a wonderful job decorating. Your sun room is beautiful, I can see why you would want to be in there for most of the day... and evening too, it's so cozy with the lamps on. I L-ove your room! The windows are gorgeous and I especially like your slipcovered sofa and that old table. So cozy looking, both day and night. What a beautiful room...it beckons to be enjoyed with a good book and a cup of tea! Thanks for sharing. I love your sunroom! The beadboard paneling is right up my ally! Love it all. I lhave a sunroom too, but it is much smaller. Yours is really like a family room! So inviting and cozy! This room screams comfy! I've said it before and I'll say it again, I love the bird lamp, I must find one. I love your sun room. It is gorgeous! I am sure you enjoy your time there....who wouldn't! I'm very jealous that your sunroom actually has furniture. Mine is a play room and only has toys in it for now. Someday though...someday it will have proper furniture. I genuinely love visiting your home (via Blogland). It is a true oasis of beauty for the eyes. Each detail is lovely and inviting. You have such a gift for decorating. Thank you for coming by and your kind words. what a Happy room.. Love all that u have in it. And i want that Rooster lamp! lol. Hands down, my favorite room thus far!! And I really adore your pillows!!!! Red is my favorite color. I love this room. I could sit there all day and read. The green paint is just what I would like in my little back bedroom. Looks very airy but still cozy. You did a great job! So lovely Kim! It cracks me up that we watch tv in separate rooms at night too! I thought I was the only one who couldn't stand hub's choices in tv shows! You also have more birds than me...and the sun room is to die for! Got some great ideas there- thanks for sharing. What an incredibly happy room! Just looking at the photos I found I had a big grin on my face. It must be a really lovely room to be in. I would live in this room full time. Great place to have my morning coffee. I have always loved this room too! I just love this style and you do it so well! Looks like the perfect place to relax! We have one of these in the plans, so I'm a little jealous!! Love your sun room, I am so jealous. You did a fabulous job with the decorating too. Beautiful room! I love my Pottery Barn sofa, with all the dirt that ends up coming into my house, washable slipcovers is the only way I can have a yellow couch! Well I was wondering why all those "L"'s were highlighted in green! Your sunroom looks so "springy". It's great that you have your own room to go to and relax. 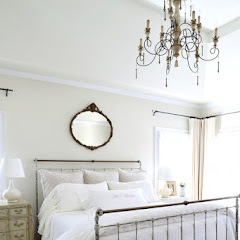 Kim, I absolutely positively ADORE this room! From the PB sofa to those gorgeous pillows you have on it. I love the colors of pillows you chose. This is such a cheerful, sunlit room. Wish my garden room had this light. You are an incredible, INCREDIBLE decorator! What a wonderful room! I love the bead board walls, the shutters, the birds, all of it! I had to laugh about TV in separate rooms. My husband and I do that too! My mother, sister, daughter and I pass furniture around and reupholster, repaint, etc,, too. Love having that continuity through the generations. Kim you definitely have a wonderful talent when it comes to decorating your home. I love your sunroom and I saw the wicker chair painted red. Oh I feel a can of spray paint being purchased this weekend to spruce up my patio. I buy many items I like but when I get home I have not idea how to put them together but your photos give me some ideas. Thanks for sharing with me. Oh Kim! I can completely see why this is your favorite room! It is beautiful! And so warm and cozy!! what a beautiful room, Kim. You've done a marvelous job furnishing and accessorizing it in every way. 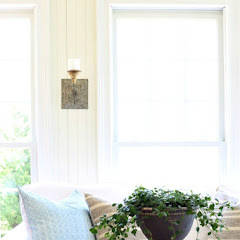 I do share your love of green for a sunroom, too. Thanks for stopping by to see us and hope you got in on our giveaway. -- Jane F.
Hi Kim! Thanks for participating in Alphabe-Thursday! Wow. What a lovely room. Your style sense is really awesome. I'm thinking maybe you need to add your own published book to that stack on top of Paula's. Looks like you could definitely do it! Thanks for this lovely stop on the Alphabe-Thursday L train! It's gorgeous! Such a bright, sunny place. And I love all the little birds. After seeing your sofa, I think I need to slipcover mine. Sigh. It looks so welcoming. And I love white slipcovers! 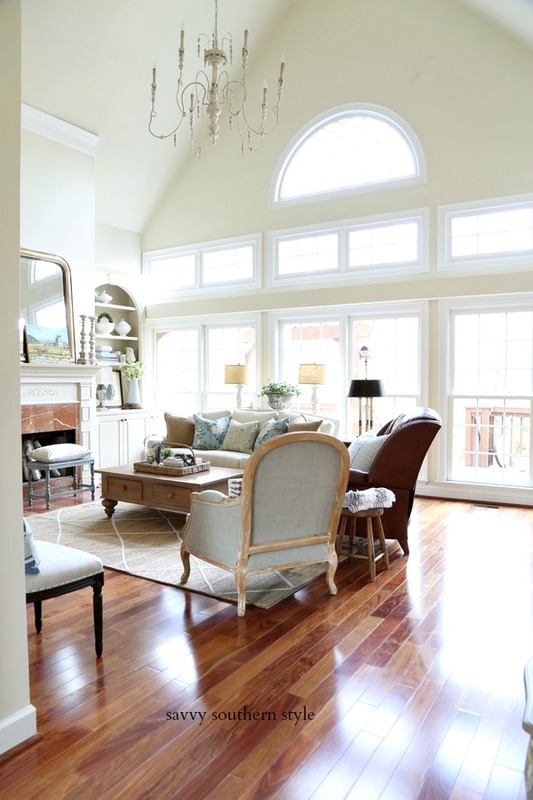 Your Sunroom's color is similar to my Master Bedroom color- it's interesting to see it in someone else's home! I would live here all day, too. Maybe fall asleep on the sofa and stay here all night, too. 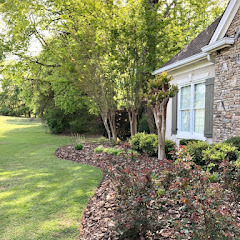 Thank you for coming by my home and welcome to my blog! This room could be featured in Southern Living. It is absolutely gorgeous. I just love your decorating style. It is so bright and sunny and the colors complement each other beautifully! This is my first time participating in alphabet Thursday! What fun! This is my first time participating in alphabet Thursday! What fun! Hey girl! I would love your opinion on my new cabinet color. Check out my new post! Kim, This is a fabulous room! I love the colors, the details and the feel! YOu and your husband should be so proud!I also love the slipcovers and the monogrammed pillow! I see you got Paula Deens new decor book. I saw it today and picked it up at Barnes and Nobles. It's yummy! Just like your room. The wicker tray table that the sweet rooster lamp is on is one I would love to have in my home! Stellar! Love LOVE the sun room! GREAT job Kim!! absolutely delightful and charming in EVERY single detail! As I was wiping the drool off my keyboard as scrolled down the beautiful images, WHAAAAAA? ...a Lake Rabun sign? Shut. Up. ...My hubby's dad grew up in Clayton and they have a house on Lake Burton! We're neighbors! I checked your bio and found you live in Buford. We live about an hour south of Atlanta below Griffin in Barnesville. AND I noticed that I had never become a follower even though I end up here quite often. Sorry about that! I hopped over from Alphabe-Thursday and am so happy that I did. Please accept my invitation to drop in at my place again one day this week when you get a moment. until later, big hug! Oh wow, what a beautiful room!! I am terribly envious. You and your husband did a wonderful job in there!!! Kim, thank you for stopping by to look at my mantel. I have lots of old books round my home, as I inherited them when my mom passed. I was lucky to get her hats, books and buttons and I have them displayed around my home. I love your sunroom, great job doing the work yourselves. My husband and I did most of the work on our own home also so I can really appreciate the hard work. The rooster lamp by the tv is adorable. Thanks for sharing. I so love this cottage look. I could go on and on about how I love everything in your fabulous room. Oh, Kim! I love your gorgeous room. Everything about it is just so wonderful. Love your furnishing and you just know how to arrange things. I would love to spend time in here and love the night shot. What a pretty room! I love how everything works together. You're quick with the Paula Deen book! I am planning to go pick it up this weekend. She's from here, so I hope they have some left...people here love Paula! Love the room! It is gorgeous!!! Wow! I can see why that is your favorite room! Thanks for sharing the photos. I totally see why you hang out in this room. I love the fun casual feel of it and the accessories are wonderful! Love it soooo much! Thanks for your kind remarks on my blog! what a gorgeous room...and i can't believe you did it all yourself. so amazing! I can see why you LOVE this room. I do too! It is beautiful and looks so warm and inviting. Congrats to you and your busband for doing such a wonderful job as well. Perfect, perfect, perfect !! I can easily see why this is your favorite space !! The furniture, the accessories ... everything works beautifully together ... I'm envious !! I really, really like your room! Everything just flow together so well and it is so beautiful. You are talented! Come link to my Friday's Favorite party... this is a cozy favorite! I could curl right up on that couch and share a glass of sweet tea. Favorite room in our house is the sun room as well. It is painted a soft yellow which makes it even more sunny looking and relaxing. My favorite place to read a good book with the dog sitting on my feet! Yours is gorgeous and so beautifully decorated. I love your sun room! You and your husband are so talented to do so much of the work yourselves. It looks like it paid off in creating a wonderful place to relax. Wow Kim this is so gorgeous! I would never leave, it would put me in dream land :) Have a great day! 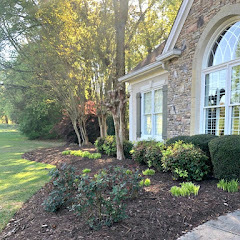 Looks just like a photo out of Southern Living! I love it! Oh and the funy table--wow! I'm new to bloggin, and hope you will check out my blog! Kim, it's all just beautiful! I love porches & sunrooms & don't have either at this house, but hoping one day to get a screened porch. That's a lovely room! Thanks for sharing it with us. Please visit Life is Good and "L is for Laundry" if you have a chance! I'd want to spend all my waking hours in this room, too. You've made a very special place for yourself - beautiful! I found your blog about a month ago and I could tell that our tastes were similar but this post was a bit uncanny. I really am reluctant to promote my own blog here but I thought you would find the similarities in images interesting. It is a rather long post so you can just skim down to the end where there are current pics of my room. Love that room, Kim. That shade of green is PERFECT!!! Kin I love your sunroom too! I can so picture myself spending all my quiet time while the men are away during the day in there! I would never want to leave this room! Everything is prefect. I love all your colors. you are right! I do love it! Someday I'd love a sunroom to enjoy :) also love ur flowerbed photos...im in love with plants lately and yours are gorgeous! Kim, so happy to have found you!!!! I searched RMS for you with no luck but did find the link to your blog.....I am now an avid follower. I commented on your sunroom on RMS when I was in the planning/construction stages of our new sunroom last summer. It's complete and will hopefully have pics up as I'm trying to create my own blog. Still in love with this room & continue to check out all your beautiful changes!!! Oh my goodness! I LOVE your sunroom! I would live there too if it were in my home! This is exactly the look I am going for in my living room.... I have been working on it for....ever. What wonderful inspiration! You have a beautiful home. Thanks for sharing! Hey Kim! I just found your blog from another blog! I love the sunroom! And you are lying about being an empty nester!! There is no way you are 54!! You look great!! !